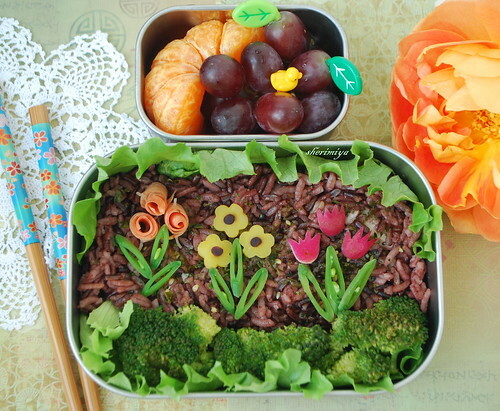 A Flower Garden Bento, originally uploaded by sherimiya ♥. Today's bento is a spring garden bento, which will be submitted to Hapabento's contest. There's still time for you to enter too! As you know, my boy is not a big rice eater, but I really wanted to use my red/brown rice as "dirt" for my garden scene. So I put a layer of roast chicken down, added furikake, and topped with just a thin layer of rice. In fact, I think you can even see the chicken below in some places. I really did put the minimum amount. I hope it is acceptable :) I also sprinkled more furikake on top, for taste. It can represent the mulch, let's say. Steamed broccoli form the border below, peapods are the stems, and the three sets of flowers are pink carrot "roses", yellow and purple carrot "daisies", and radish "tulips". I lined the box with green lettuce leaf as well, to further the growing garden theme. cute flowers in your bento! 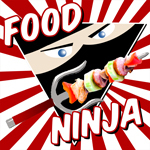 I just purchased my first bento boxes this weekend. I'm so excited to start preparing my own pretty yummies! Thanks Susan B., megan and Laura! Beautiful. :) The red rice is a really nice touch... (And I was just thinking today about how much I adore red rice) ....I hope your boy enjoys it. I also love the techniques you used to get all three sets of flowers. mmm, I love the scent of pikake; reminds me of my mom because it is her favorite flower. Cute cute bento, and I like the carrot roses best! Thanks hypothermya! We both had red rice, eh? I love it too. Seems more substantial and satisfying to me than white rice. Thanks Rachel! Pikake was my fave flower in high school. We grew the triple pikake in our garden. So luscious!! Very pretty! This garden bento is so life with those colorful flowers. Good luck for the contest! You clever mom you! Serving what your son will eat and getting a good looking box out it too! I really like the flowers, very pretty! This is definitely a pretty garden with blooming flowers! Love the 3 types of flowers so much! Wish you good luck in the contest! bentobird, I take a cue from your lovely garden-like bento shots. Thank you so much! Kind of you; many thanks Angeleyes!! Very beautiful! Each flower is so delicate and unique.